TNPSC Notification is out. 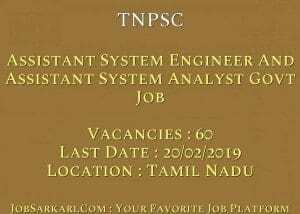 TNPSC is recruiting for 60 Assistant System Engineer And Assistant System Analyst Govt Job Posts. You can check TNPSC - Tamil Nadu Public Service Commission last date, download TNPSC notification, visit TNPSC official website and check other TNPSC Vacancy details.Complete Vacancy and recruitment Details about 60 Assistant System Engineer And Assistant System Analyst Govt Job vacancies in TNPSC are provided below by JobSarkari.Com only for you. Last Date of Apply Online. 20/02/2019. Last Date of Pay Fee. 22/02/2019. SC/ ST. No Fee. No Fee. MBC/ BC/ Ex-servicemen. Rs.150/- (No Fee For Those Candidates who Have Not Availed three Free chances so far in The previous Recruitments). Rs.200/- (No Fee For Those Candidates who Have Not Availed three Free chances so far in The previous Recruitments). Mode of Payment. Candidate Need to Pay Fee Through Net Banking, Debit Card/ Credit Card. Assistant System Engineer. Candidate Must Have Passed B.E. or B. Tech in Any one of Subject (a) Computer Science and Engineering (b) Computer Engineering (c) Information Technology (d) Electronics and Communication Engineering (e) Electrical and Electronics Engineering And Having 60% Marks in Class 10th And 12th. 36. Assistant System Analyst. Candidate Must Have Passed B.E. or B. Tech in Any one of Subject (a) Computer Science and Engineering (b) Computer Engineering (c) Information Technology (d) Electronics and Communication Engineering (e) Electrical and Electronics Engineering And Having 60% Marks in Class 10th And 12th. Having Post Graduate Degree in Any one Subject of (a) Computer Applications (MCA) (b) Computer Science (c) Information Technology As Mentioned in Notification. 24. Age Relaxation. 2 Years For MBC/ BC And 5 Years For SC/ ST.
7. Online Application Can be submitted On or Before 20th February 2019. Q. What is the Last Date For TNPSC Assistant System Engineer And Assistant System Analyst Govt Job Vacancy ? A. 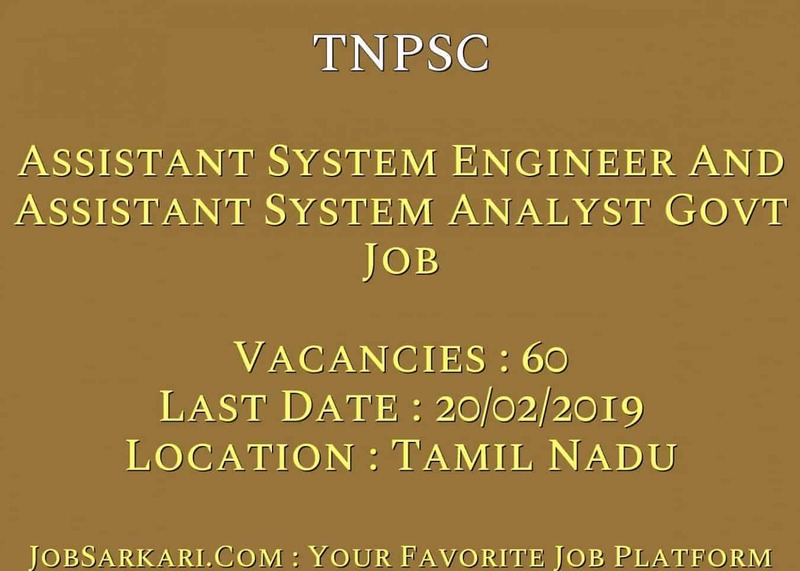 Last Date for TNPSC Assistant System Engineer And Assistant System Analyst Govt Job Posts is 20/02/2019. Q. What is the Form Type of TNPSC Assistant System Engineer And Assistant System Analyst Govt Job Recruitment ? A. The Form Type for TNPSC Assistant System Engineer And Assistant System Analyst Govt Job Posts is Online. Q. How many vacancies are available in Tamil Nadu Public Service Commission Assistant System Engineer And Assistant System Analyst Govt Job Posts ? A. There are about 60 Vacancies in Tamil Nadu Public Service Commission Assistant System Engineer And Assistant System Analyst Govt Job Posts. Q. What is the Full Form of TNPSC ? A. Full Form of TNPSC is Tamil Nadu Public Service Commission .